Online streaming services are taking the Internet by storm. Previously, there was only Netflix, the undisputed king of streaming services. Now there is Hulu, Prime, HBO, and many more in the making like Disney. Apart from these streaming services, there are other apps looking for a piece of your credit card like Audible for audiobooks and eBooks. Some other examples can be WiFi, meal delivery, gym memberships, and so on. The question is how do you manage all these subscriptions and remember when are they due? Why do you want this information? So you can pay bills on time because most of us have our credit cards maxed out. Also, some people are paying for subscription services without even knowing it. You may want to cancel a certain subscription but wait for the due date so as to enjoy the benefits till the last few days. Why not? You paid for it. Let’s take a look at some of the best subscription manager apps that are available on Android and iOS platform. 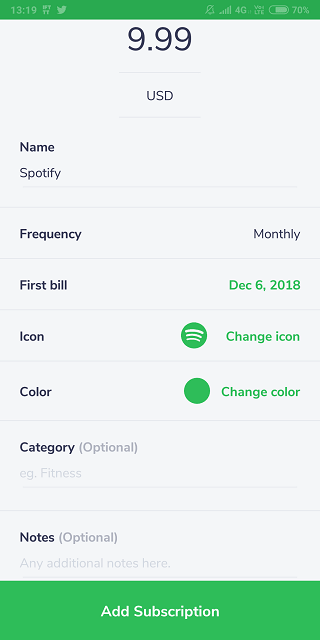 Truebill is a very popular subscription manager app that will let you manage all your subscriptions and see where all your money is going to every month. The way it works is pretty simple. You install the app on your Android or iPhone and sync all your bank accounts and credit cards. Truebill will then begin monitoring your bills to identify services that are charging you every month. Recurring items. You will be immediately notified (reminders!) about the same allowing you to reconsider your options before the next due date arrives. 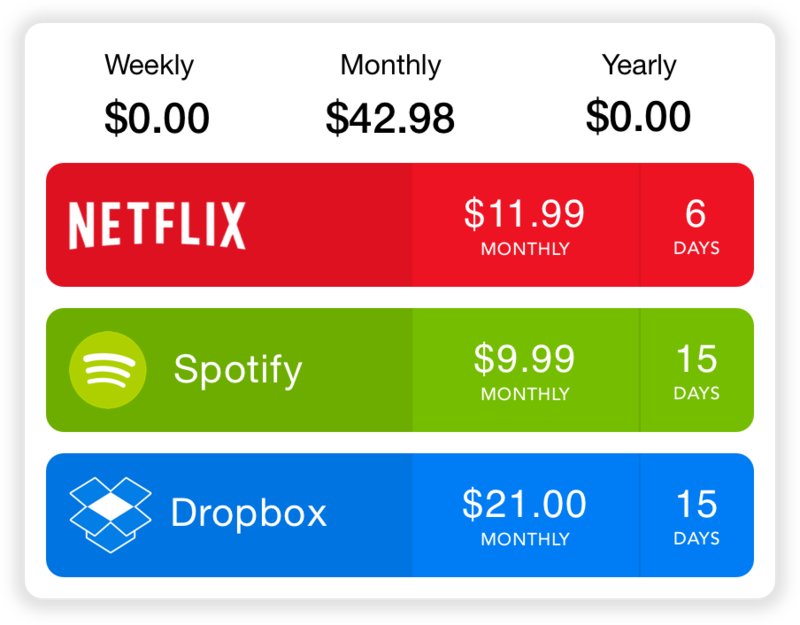 Truebill will also collect past data on these subscription services so you will know how long have you been paying and total amount that you have paid so far. A reality check on how much you could have saved if Truebill was installed on your smartphone. Another feature is refund of late fees payments. A lot of services will charge you extra in case your credit card fails to make the payment on due date. Truebill will try, and often succeed, to claim a refund before canceling the subscription for good. Truebill is free to use but comes with in-app purchases and a subscription model that begins with $2.99. It is currently available for US customers only. I hope they will soon launch in other countries too. Not everyone likes the idea of putting too much faith in a single app. There is always the risk of a data breach in which case of a data breach. You could lose banking and credit card data along with your entire financial history. Enter Billy. 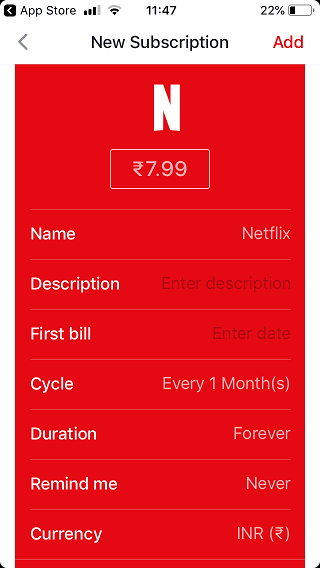 A simple to use app that will let you enter details of all the subscriptions you are using but manually. You can add and remove services as you move forward. 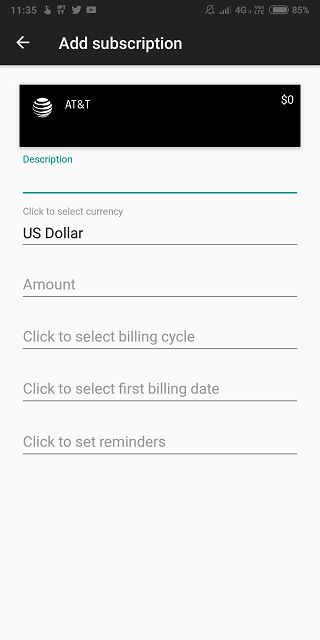 Just tap on the plus icon, select an existing service from the exhaustive list, enter a description, select your currency because you can be living and be billed in any country, amount, billing cycle, first billing date, and reminders. Billy is really helpful for those who are using international services too. For instance, if you live in Canada and subscribe to Canada’s Netflix and U.S’s Hulu service, you can add them both in the different currency. You can also choose a base currency so all your subscriptions will be converted to your home currency and rates will be updated at the time of billing. And finally, sign in using your Google account so all your data remains in sync and in the cloud. The app is free to use with no ads whatsoever but it will ask you to upgrade after adding two services, which makes little sense. 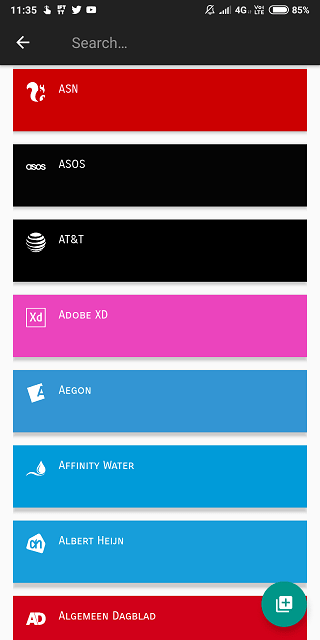 If I’m using a third-party app to manage my subscription, chances are I have at least a handful of subscriptions. And restricted to only 2 subscriptions in the free version make little sense. Thankfully, you can remove this restriction with a one time fee of $1. Bobby, like Billy, will let you track your subscriptions without having to attach your bank and credit card details. You will begin by selecting a service you are subscribed to from the menu which offers a long list, or enter custom values, select your currency, due dates and billing cycle, and description. There is support for multi-currency. You will be reminded before your subscription becomes due based on how many days before the due date you want to be reminded. If your service is not on the list, you can enter custom values. The app is free to use for up to 4 subscriptions (slightly better than the previous app) after which you will have to upgrade with a $0.99 in-app purchase. You can then add unlimited services, sync data to iCloud, add custom colors, fonts, and icons, and secure the app with a fingerprint. Outflow works on the same basic principles as other subscription manager apps that we saw before it. You begin by choosing a subscription service from the drop-down menu and adding details like billing cycle, cost, reminders, description or notes, and currency. Apart from support for multiple currencies, there is also support for real time exchange rates. Where Outflow differs is that it will collect data from your Gmail account to see which other services are you subscribed too, and based on that will recommend new services to subscribe. You can see how much you are paying, days left, and next renewals at a single glance. You can buy Outflow for a one-time fee of $1.99 which is really low for the utility it provides. Only caveat is that there is no way to sync data. Subby is a simple and basic app that will let you track services you are subscribed to easily. Subby comes with a list of popular services that will appear as you type. There are no templates or list of services to choose from. 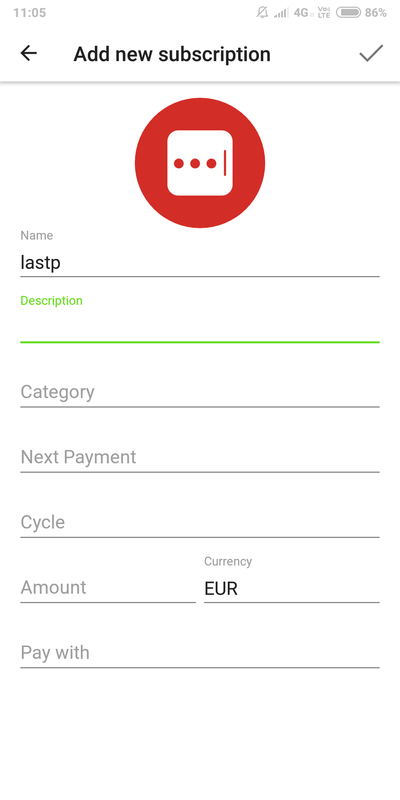 When you launched the app, you will be greeted with a form where you can fill details like name, description, a category like streaming, hosting, fitness or food, payment date, billing cycle, amount, currency, and account/card you are paying with. 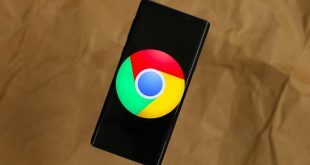 The app is ad-supported and the pro version, for $2.99, will remove ads, take backups in Google Drive, add a widget and ability to request service icon. So, if you are using a service that is not part of the list, you can request them to add icon for the same. 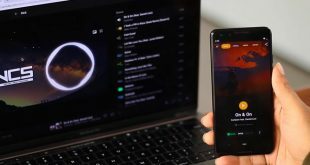 Nate is another subscription manager app for Android platform that will let you reconsider the services you are paying for, sometimes without even knowing because as humans, we tend to forget. You can choose from an existing list of template for all popular services or create a custom one for like WiFi etc. Nate will then remind you based on your billing cycle and the amount you are paying. You can take additional notes too. Nate also supports changing default icons or using custom ones, change billing frequency, create categories to group similar services, and support foreign currencies. The free version will let you add only three services but you can unlock for $0.99 to enable adding unlimited services too. Trim can be considered in the same league as Trubill. 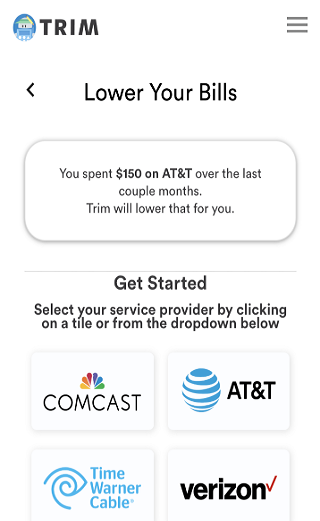 You create an account and Trim will ask you to connect all your bank accounts and credit cards that you are using to pay for subscription services. It will then collect data and use this to create a list of all the services and apps you are subscribed to, how much are you paying, and when are the due dates. Trim will begin reminding you of renewals so you can make a call and unsubscribe if needed. Like Truebill, Trim uses the same Plaid technology to link all accounts and uses 256-bit encryption to keep your data safe. As more data gets collected, you will learn the total amount that you have paid and have saved so far. 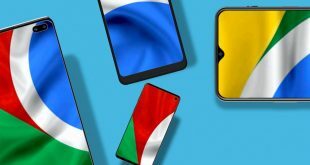 Not only this, but it will also negotiate with service providers, where possible, to reduce your billing amount or get refunds on late payment charges. Additionally, Trim will also send you text messages when due dates arrive. Only for US residents. SubscriptMe will not connect with your bank and credit card accounts but instead, it will scan and monitor your email inbox and your smartphone to create a list of all the services that you are subscribed to on your iPhone. Once it does that, the app will remind you of due dates and the amount to be paid. During tests, SubscriptMe was able to detect about 80% of my subscriptions accurately. Note that the app is not 100% accurate when it comes to collecting data and may make mistakes while creating entries. This makes SubscriptMe subscription manager app less usable but still a solid option. This way, you don’t have to input all the details yourself. Just cross-check everything and input the ones that were left by the app. The app is free to use. SubscriptMe will also help you discover new services to subscribe to that are popular among its users. 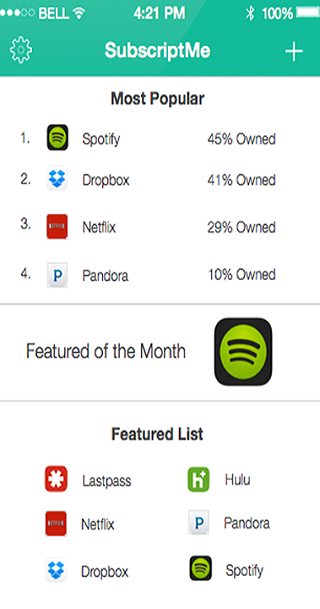 The Best Subscription Manager Apps? There are quite a few options to choose from so I will make it simpler for you. If you live in the US and willing to connect all your banking and credit cards, Truebill and Trim are the best. You can choose any but I would suggest you try both. If sharing bank details spooks you, depending on the mobile platform that you are using, go for Billy, Bobby or Nate. It’s interesting how all these apps have similar features named after humans.